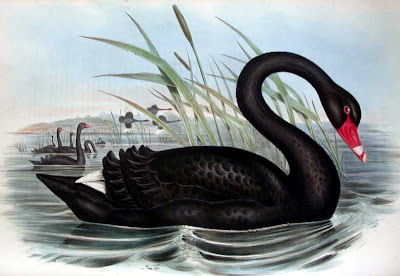 The Australian Black Swan From John Gould's The Birds of Australia, 1840-1848. The illustration is by either Elizabeth Coxen Gould or Henry Constantine Richter. The recent sale of a first edition of John James Audubon's Birds of America for $11.5 million made it the most expensive printed book in history. In fact an article in The Economist online estimates that, adjusted for inflation, "five of the ten highest prices ever paid for printed books were paid for copies of Birds of America." Those two items must have Victorian ornithologist John Gould, known as "The British Audubon," spinning in his grave. John Gould. An 1849 portrait by T.H. Maguire. John Gould was the most ambitious of all Victorian ornithologists, combining a shrewd and uncompromising business sense, with a sharp eye for specimens, and a sharper one for artistic talent. In his own time, as he would have been the first to inform you, Gould was just as famous, and more financially successful, than Audubon. 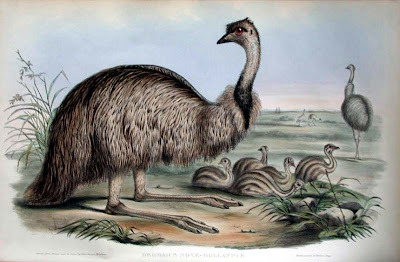 The Emu From John Gould's The Birds of Australia, 1840-1848. John Gould was the son of an ambitious gardener, who through hard work and diligence became the foreman of the Royal Gardens at Windsor. Gould learned two things from his father: a love of the natural world and a belief that a man could rise above his station through sheer determination. From John Gould's The Birds of Australia, 1840-1848. From one of his father's fellow gardeners Gould learned the art of taxidermy. Skill at preserving birds and animals was highly prized among Victorians, and some said his passion for it verged on an obsession. In any case, Gould set up his first business in Windsor as a taxidermist, and quickly won recognition for his ability to make his subjects look "natural." He became so adept at the trade that he was commissioned to stuff a giraffe for King George IV. 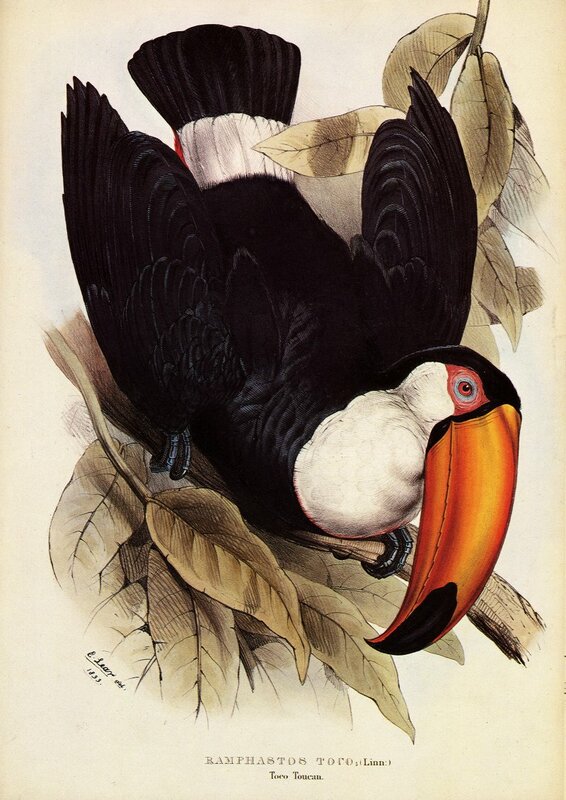 Gould's chance to advance beyond taxidermy came in 1827, when the newly founded Zoological Society of London held a contest to hire its first director and curator. 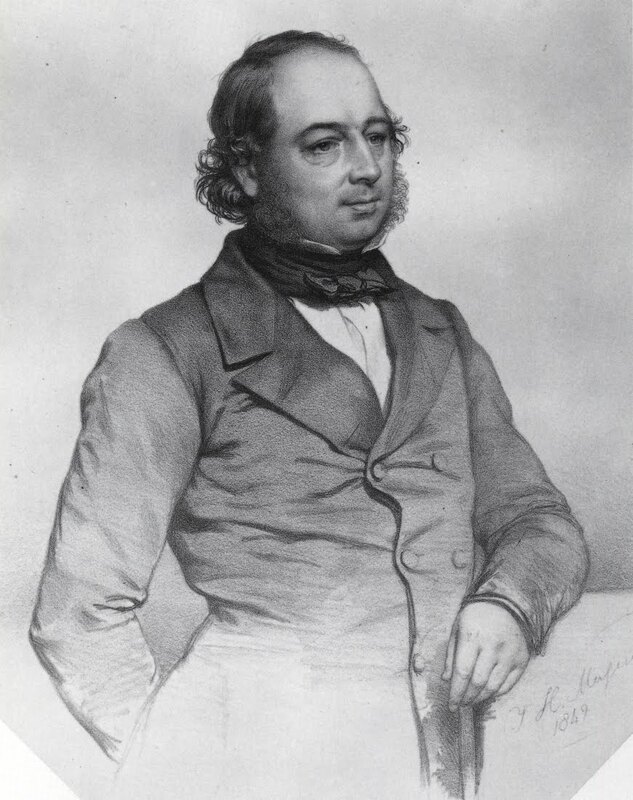 Despite having almost no formal education, John Gould entered and won the position. In 1830 the Society acquired a large collection of bird skins from the Himalayan region of Asia. These exotic specimens, many never before documented, gave Gould the idea of publishing an illustrated guide depicting the rare birds. 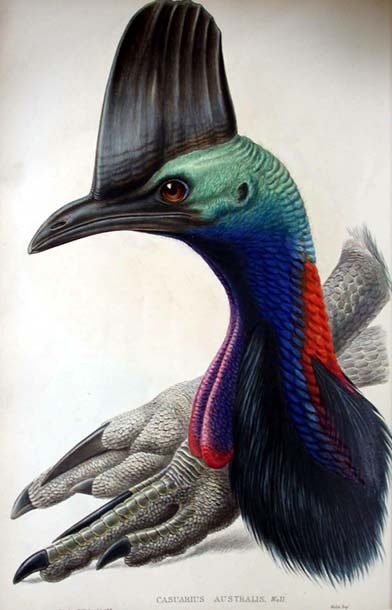 This became his first published work, A Century of Birds from the Himalaya Mountains (1830–1832). It should be noted that although Gould was credited as author, the text was written mostly by the secretary of the Society, Nicholas Aylward Vigors, and the lithography was done by primarily his wife, Elizabeth Coxen Gould, based on John Gould's original sketches. This became a pattern with Gould throughout his career. He repeatedly took sole credit for accomplishments that were in fact a team effort. The other unsung contributor to Gould's first book was Edward Lear. 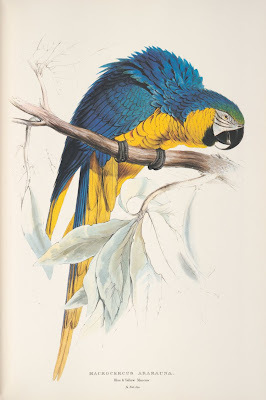 In 1830 Lear published the first two folios of Illustrations of the Family of Psittacidae, or Parrots, a ground-breaking work of ornithology for several reasons: it was the first bird book published in the large folio size, the first on a single family of birds, the first in which all of the specimens were drawn from life (at the Parrot House of London's Zoological Gardens), and one of the first to use the relatively new process of lithography, rather than engraving, for illustrations. Alas for Lear, while his work was an artistic triumph, it was also a financial failure. He spent too much time obsessively perfecting his work, and not enough selling subscriptions and collecting payments. 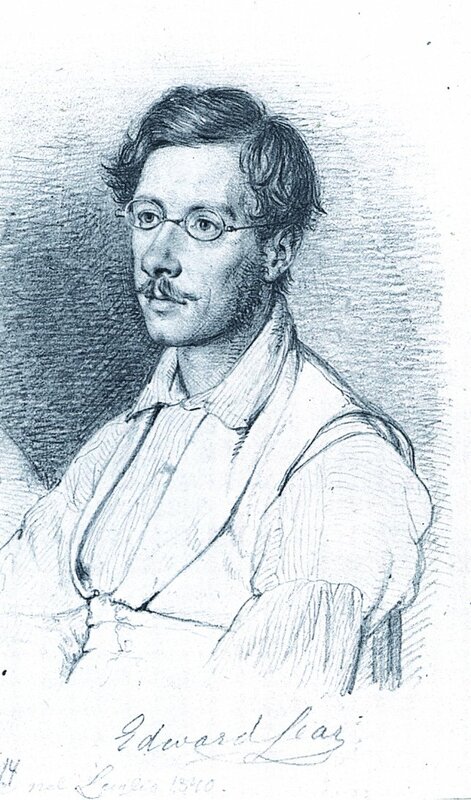 as drawn by his friend Wilhelm Marstrand. But Lear's business failure was Gould's opportunity. He not only hired Lear to work for him, he appropriated Lear's format and style as his own. Thus all of Lear's innovations were soon attributed to the more successful Gould. (Save for the fact that Gould often used preserved specimens rather than live birds as his subjects.) Lear taught the lithography process to Elizabeth Gould, and drew all of the backgrounds for her illustrations. None of his work was credited. 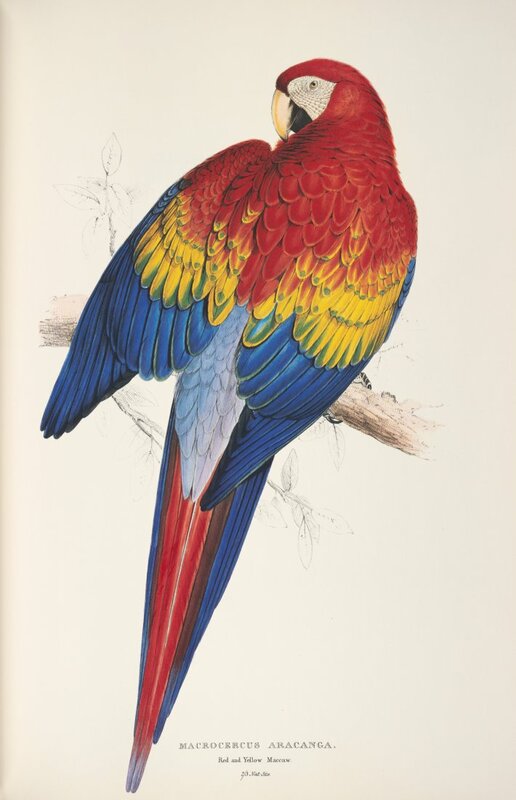 or Parrots by Edward Lear. 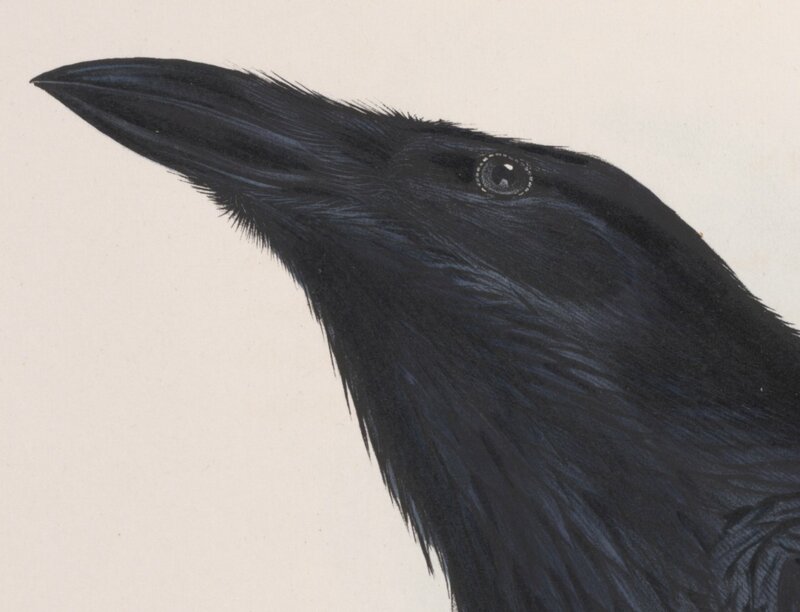 The relationship between Lear and Gould has been called "seven years of exploitation," in an online exhibit on Lear's ornithological illustrations from Cornell's University's Albert R. Mann Library. According to the exhibit, Lear created ten complete plates for Gould's 1834 work, A Monograph of the Ramphastidae, or Family of Toucans, with no acknowledgement whatsoever, and with his signature actually having been erased from the plates in the second edition. In total Lear contributed to six of Gould's books. from Volume III of John Gould's The Birds of Europe. John Gould was by anyone's estimation a master of the business of books. He deserves immense credit as one of the nineteenth century's greatest natural history publishers. Driven and prolific, he produced 15 major works on birds, containing over 3,000 color plates, and covering every major continent save Africa. Additionally, he wrote over 300 scientific articles and many smaller books. If he had been content to be remembered as an ornithologist and publisher, his legacy would have been untarnished. 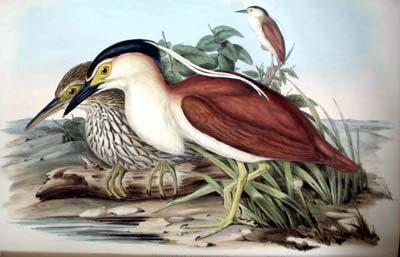 But John Gould's desire to be held in esteem as an artist and writer caused him to needlessly take credit where credit was not due. Upon Gould's death in 1881, the usually affable Lear wrote, "He was one I never liked really, for in spite of a certain jollity and bonhommie [sic], he was a harsh and violent man... [A] persevering hard working toiler in his own line, but ever as unfeeling for those about him... He owed everything to his excellent wife,—& to myself, without whose help in drawing he had done nothing." A sad coda to a life of true accomplishment, shadowed only by the need to be seen as an artistic genius, when being business genius was enough.